October 31, 2012  In New York City, early estimates for fixing the damage to the mass transit system are already in the billions. But New Yorkers used to zipping around the city in subways are thrilled to get even limited bus service back after the devastating storm. October 30, 2012  The New York City subway system remained closed on Tuesday in the wake of Sandy. Millions of gallons of water poured into the subway's tunnels, overwhelming its pump system. October 14, 2012  Syria's Alawite minority has largely maintained its solid support for President Bashar Assad, a fellow Alawite. 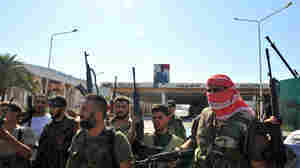 But recent developments, including the defection of an army colonel, suggest there are now cracks in the Alawite community. October 1, 2012  The Syrian American Medical Society is quietly providing aid inside the embattled country. Some doctors see a series of "relatively safe" towns along the Turkish border as a place to begin rebuilding Syria's decimated health care system. 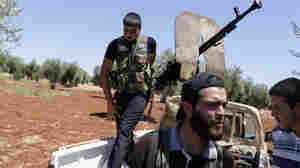 September 19, 2012  Tensions are growing between the homegrown rebels and Islamist radicals who have come from abroad. They both oppose the Syrian government but disagree on many fundamental issues. 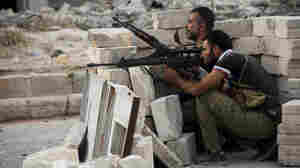 Recently the rebels and the foreign radicals battled each other in northern Syria. September 10, 2012  Over 18 months, the Syrian revolt has transformed from a peaceful protest movement to a brutal civil war with no end in sight. And as the conflict grinds on, activists who once led peaceful demonstrations have joined rebel brigades and have their own, often dangerous work to do. September 5, 2012  The Syrian helicopter gunships and fighter planes that regularly strike villages nearby don't fly over Kfar Ghan. Turkey warned that any Syrian military aircraft near the border would be a target. The difference from the rest of Syria is evident: The shops are open, and there are kids on the street and a crowd of shoppers. September 4, 2012  The Syrian rebels captured a border post on the frontier with Turkey, and have since had to deal with a crush of refugees. For now, at least, the border crossing is relatively calm and well-organized. September 3, 2012  Syrian rebels have gained control of a series of towns along the Syrian-Turkish border, including the northern town of Azaz. 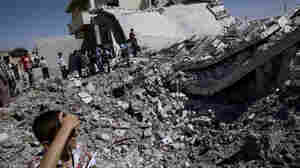 But government forces continue to launch airstrikes there. Azaz is trying to move forward, but it's largely a ghost town now, as tens of thousands of residents have fled to Turkey. September 2, 2012  NPR's Deb Amos has the latest from Syria, focusing on the refugee exodus amid sustained government attacks on towns and villages in northern Aleppo province.